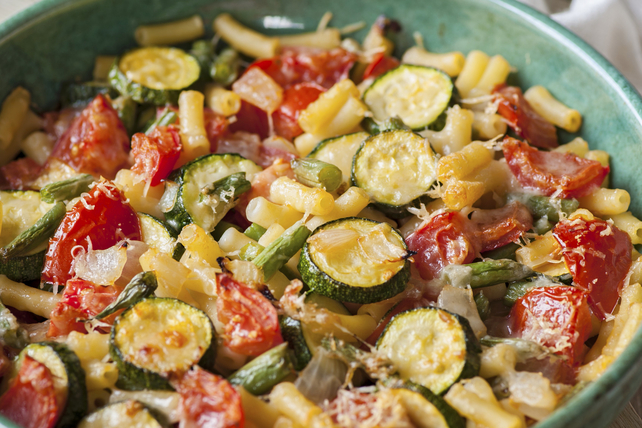 Looking for a delicious way to use a bounty of fresh veggies? Our Mediterranean Pasta Skillet provides the answer. Made with fresh zucchini, tomatoes, green beans, a creamy Alfredo sauce and Parmesan cheese, this delicious main dish is as comforting as it is easy to make. Cook macaroni in large saucepan as directed on package, omitting salt and adding beans to the boiling water for the last 5 min. Meanwhile, heat oil in large deep skillet on medium heat. Add onions; cook 3 min. or until crisp-tender, stirring occasionally. Stir in zucchini, grape tomatoes and garlic; cook 8 min. or until zucchini is crisp-tender, stirring occasionally. Add pasta sauce and sun-dried tomatoes; mix well. Cook 3 min. or until heated through, stirring occasionally. Drain macaroni mixture. Add to vegetable mixture in skillet along with the cheese; mix lightly. Stir in 2 Tbsp. chopped fresh basil before serving. Prepare using any other small pasta shape, such as rotini or gemelli.